Abnormal uterine bleeding (AUB) is bleeding from the uterus that is longer than usual or that occurs at an irregular time. Bleeding may be heavier or lighter than usual and occur often or randomly. It does NOT occur during pregnancy. Bleeding during pregnancy has different causes. If you have any bleeding when you are pregnant, be sure to call your health care provider. Every woman's period (menstrual cycle) is different. On average, a woman's period occurs every 28 days. Most women have cycles between 24 and 34 days apart. It usually lasts 4 to 7 days. Women in their 40s may start to have their period less often or have the interval between their periods decrease. For most women, female hormone levels change every month. The hormones estrogen and progesterone are released as part of the process of ovulation. When a woman ovulates, an egg is released. AUB can occur when the ovaries do not release an egg. Changes in hormone levels cause your period to be later or earlier. Your period may sometimes be heavier than normal. AUB is more common in teenagers or in premenopausal women. Women who are overweight also may be more likely to have AUB. AUB is unpredictable. The bleeding may be very heavy or light, and can occur often or randomly. A woman may feel tired or fatigued if she loses too much blood over time. This is a symptom of anemia. Endometrial biopsy is the removal of a small piece of tissue from the lining of the uterus (endometrium) for examination. Your provider may put you on iron supplements if you have anemia. If you want to get pregnant, you may be given medicine to stimulate ovulation. Hormone therapy often relieves symptoms. Treatment may not be needed if you do not develop anemia due to blood loss. A treatment focused on the cause of the bleeding is often immediately effective. That is why it's important to understand the cause. 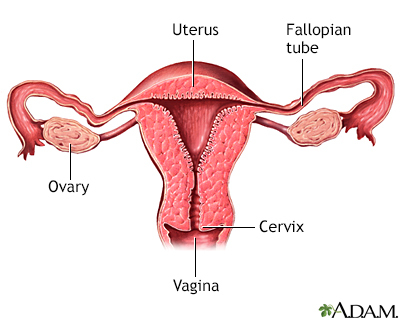 Endometrial cancer is cancer that starts in the endometrium, the lining of the uterus (womb). Call your provider if you have unusual vaginal bleeding. American College of Obstetricians and Gynecologists website. ACOG committee opinion no. 557: Management of acute abnormal uterine bleeding in nonpregnant reproductive-aged women. Reaffirmed 2017. www.acog.org/Clinical-Guidance-and-Publications/Committee-Opinions/Committee-on-Gynecologic-Practice/Management-of-Acute-Abnormal-Uterine-Bleeding-in-Nonpregnant-Reproductive-Aged-Women. Accessed October 27, 2018. Bahamondes L, Ali M. Recent advances in managing and understanding menstrual disorders. F1000Prime Rep. 2015;7:33. PMID: 25926984 www.ncbi.nlm.nih.gov/pubmed/25926984. Schrager S. Abnormal uterine bleeding. In: Kellerman RD, Bope ET, eds. Conn's Current Therapy 2018. Philadelphia, PA: Elsevier; 2018:1073-1074.